So you have this revolutionary idea of educating your kids at home? Very good! But by doing so, aren’t you preparing to become an outlaw for our society? Will you have to flee to the countryside in order to conceal your illegal activities? Will you become some kind of a rebel or terrorist? Far from it! In fact, you are about to join a growing number of parents in Canada who take to heart the education of their children and have decided to take up this responsibility. So your choice is good news for the society because you’re about to produce – on a human and academic level – a quality citizen who will have benefited from a top-notch, private education. Moreover, whichever province or territory you live in, legislation will recognize your right to educate your own children. At this point, you may wonder why, if laws are so homeschool-friendly, should we need an association such as HSLDA in order to defend our rights? Mainly because many entities are also interested in the education that your children receive: your local school and school board first, but social services and government, too. Unfortunately, it may happen that, in a legitimate attempt to make sure your kids are properly educated, some of these people will be tempted to override your fundamental rights in this area. Whether because of a lack of information, an excessive zeal, or any other reason, some may wrongfully try to question the quality of education your children receive and to force you to conform to their own vision of education or even to force your children to integrate into the school system. HSLDA makes sure that these people are well-informed about the legitimacy of your choices and, if necessary, defends your rights and freedoms when they are ignored despite everything. Knowing that the law is on your side, you can consider homeschooling without feeling threatened, and therefore adopt an attitude of cooperation with the different people you will meet. If, for example, your school board asks you to be accountable regarding the education of your kids, it is normal to reassure them, knowing that it is their responsibility to make sure your children are properly educated. Nobody wants neglectful parents to keep their kids at home without giving them an education that is at least equivalent to what they would get at school. As a responsible citizen, you can therefore collaborate with their efforts in this matter, knowing that they are simply doing their duty. However, the approach of school boards may vary from one place to another. Some school boards are easily satisfied, while some others may demand to control not only the results of your education but the methods and the books you choose and even the worldview you teach to your children. In many instances, parents are ultimately asked to duplicate the current school model, thus depriving homeschool parents of most of the advantages that motivated them to choose this avenue in the first place. Such an intrusion is generally not the result of evil intent; official structures simply often have a natural bent toward homogenisation. So it’s the parent’s duty to politely but firmly make sure that their rights are respected. In this regard, HSLDA is your partner and is able to offer you the help and advice you need to deal properly with these people. 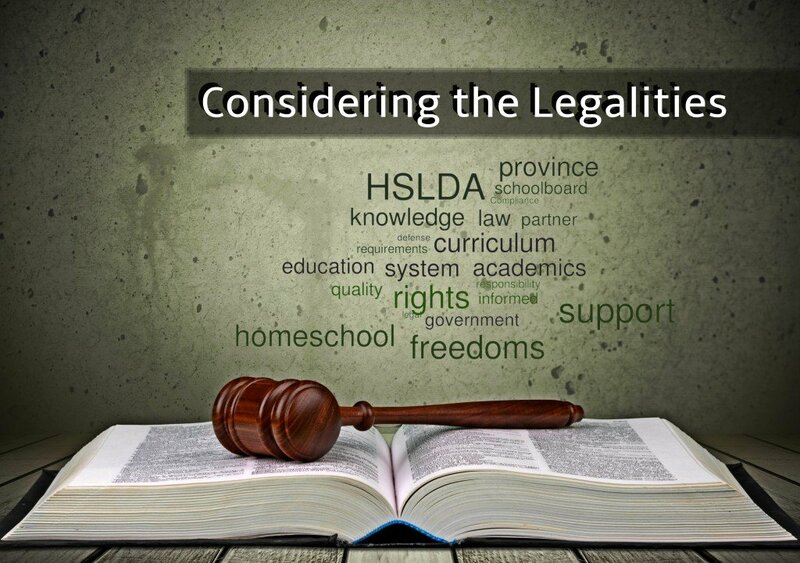 And if the authorities reach the point where they want to coerce you into conforming to their system of education, HSLDA offers the legal support you need. If you’re contemplating homeschooling, don’t hesitate to contact us to get advice BEFORE you make any move. This way, we will be able to walk you through each step, whether your kids are preschoolers or you are considering taking them out of the school system. Thus, you will make sure that your actions are in line with the specific laws of your province or territory and that your interactions with the authorities go as smoothly as possible, while respecting your legal rights. HSLDA’s website offers the main information you will need in order to make your homeschooling experience a success. If you’re at the beginning of the adventure, the members section offers a summary of the current laws in each province and territory, alongside the practical steps and forms you will need to start. For more information, you can contact us by phone to get a personalized support. We hope your homeschooling adventure will be an opportunity not only for you to educate your children but to learn with them and to build a solid and unique relationship that will last for a lifetime.